To prevent water from entering a cored composite structure, fastener holes should be over-drilled and reefed before hardware is installed. The purpose of the core is to add rigidity to the otherwise flexible inner and outer FRP skins. When composite-core construction is done correctly, it’s an immensely strong, comparatively lightweight, and reliable method that is stiffer than solid skins of equal weight. Marine industry professionals know all this; however, when asked by boat owners to explain why they should consider a cored composite vessel, I notice the pros often have trouble articulating its attributes. If you find yourself in that position, practice a one-paragraph explanation that sums up what cored-composite construction does well. Also point out that two of its primary potential weaknesses—water intrusion and point loading—are entirely avoidable, provided the proper procedures are followed. If water is allowed to enter the core, it is capable of wreaking havoc with the structure and subsequently the boat owner’s wallet, as well as the wallet and reputation of the boatbuilder, boatyard, or aftermarket equipment installer. The primary—and preventable—culprit when it comes to water ingress is improper hardware installation. Ideally, the designer or naval architect has detailed where each piece of deck or hull hardware will be installed. Knowing this, the builder then laminates into these areas either solid fiberglass or high-density core designed for this purpose. Finally, the folks on the shop floor install the hardware using the accepted method of measure, drill, apply sealant, and install. However, this is often not the case. Naval architects and designers may fail to anticipate every hardware installation, and/or builders fail to install hardware pads during the lamination process, or hardware is added after the design is complete or years after the boat is delivered. In any case, another approach is required. To allow removal of surrounding core, holes for hardware should be over-drilled 1-1/2 times the size of the hardware to be installed. The thumbnail sketch of the preferred procedure below should be followed whenever a cored composite structure is penetrated for hardware installation. Yet, the industry is rife with violations of what should be an inviolate composite truism: close out or suffer the consequences. 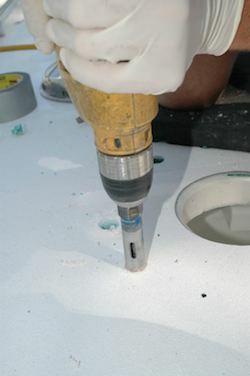 Core must be removed to enable the epoxy to lock in or “key” with the structure. 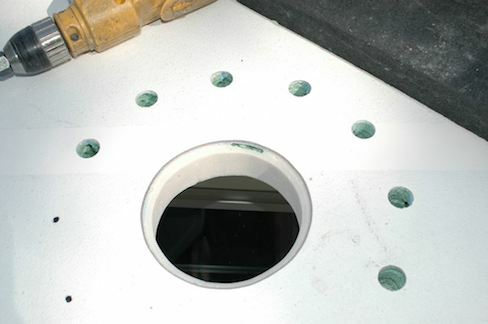 Once the epoxy has fully cured, redrill both holes for the fastener that is to be used, and chamfer the edges of the outer hole to create a land or recess for sealant. Now, wipe the area down with a damp rag to remove amine blush, a water-soluble wax that forms on the surface of cured epoxy. Solvent is not necessary for this wax, and it should not be used. Note that most rags, whether purchased as the common bag of rags, or your recycled T-shirts, are contaminated with laundry detergent residue and surfactant, which can contaminate bedding surfaces. Simply rinse rags in clean water and allow them to dry to eliminate this potential source of failure before hardware-installation wipe-downs. Then, wipe the hardware to be installed and the fasteners, as well as the fiberglass or gelcoat, with a clean rag moistened with 3M General Purpose Adhesive Cleaner or mineral spirits to remove wax, oil, and other contaminants. Solvent must be used because these contaminants are not water soluble. The propensity of these contaminants—amine blush, oil, and wax—to cause sealant failure should not be underestimated; just watch a clean white rag turn black as you wipe down the hardware. 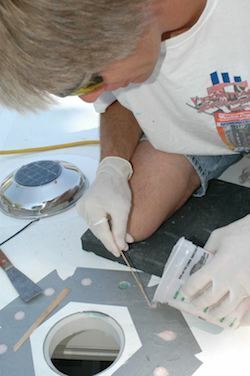 Remove loose core material before applying epoxy. Ideally, hardware should not be bedded over nonskid surfaces. In practice, particularly for aftermarket hardware installations, this may be unavoidable. When it is, make every effort to thoroughly clean and free nonskid surfaces of dirt, debris, and especially wax; a stiff plastic bristle brush and solvent may be required. 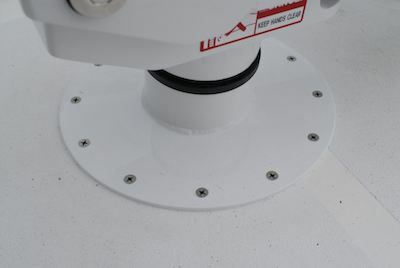 Finally, apply polyurethane or polysulfide bedding compound to the bottom of the hardware as well as to the fasteners. If the bedding will be visible after the installation is complete, as a fillet for instance, make certain it is UV resistant. Do not apply bedding compound to the portion of the fastener, washers, nuts, or backing plate inside the vessel; omitting sealant here will allow water to leak into the vessel when the outer bedding fails, letting you know it’s time to rebed. Bedding on the inside of the fastener will only hold the water in the fastener hole, which may lead to crevice corrosion of stainless steel fasteners, or water penetration into the core. Carefully apply epoxy, ensuring air entrapment is minimized. Contrary to dockside lore, fasteners should be fully torqued at the initial installation. There are some who practice a two-stage torque process; however, it’s not one I’ve embraced, and with good reason. The two stages call for first lightly torquing fasteners, allowing bedding compound to cure, and then returning to fully tighten the fasteners. The presumed logic is that the cured sealant becomes a gasket of sorts. 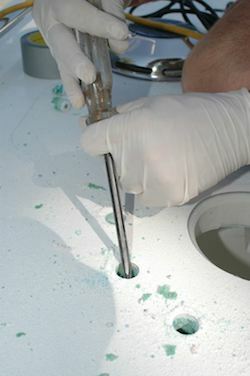 In reality, and particularly for loaded hardware such as winches, windlasses, stanchions, and cranes, the leverage imparted to the hardware often leads to ruptured sealant “gaskets.” If fastener holes include the aforementioned chamfer, the sealant deposited there creates an O-ring that cannot be crushed or ruptured. Having practiced both approaches on many occasions, I can say with assurance that the two-stage torque-down-and-gasket process is considerably less reliable. After torquing, clean up as much excess sealant as possible—you should have plenty of squeeze-out, or excess sealant pushed out around the hardware, forming a fillet of sorts—with a clean dry rag, and finally with a rag moistened with the solvent specified by the sealant manufacturer. (My choice of solvents for this process is 3M General Purpose Adhesive Remover or mineral spirits). Do not clean sealant using denatured alcohol, as it will indefinitely inhibit the polyurethane curing process. The finished product is now resistant to crushing and water penetration. With this approach, you’ve achieved two ends. One, you’ve virtually eliminated the possibility of water entering the core at the fastener penetration. Two, and just as importantly, the epoxy ring prevents the fastener from crushing the core (a ¼″ fastener can exert over 500 lbs/227 kg of pressure on the core, so four closely spaced fasteners could apply a ton of force). If the fastener crushes the core, it will almost certainly lead to water ingress because of the funnel-like depression that’s created. 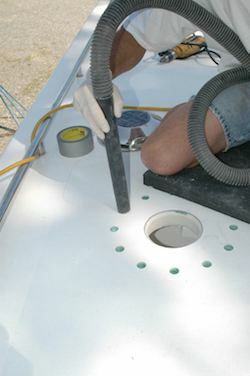 It is for this reason that simply coating exposed core with resin, epoxy, or sealant, a procedure that is favored by far too many boatbuilders, boatyards, and industry professionals, is nearly always inadequate, particularly on highly loaded items like cleats, stanchions, pad-eyes, and winches. With few exceptions, penetrations in cored substrates, regardless of the hardware type or load, should have either the preinstalled solid FRP or high-density purpose-made core inserts, or undergo an after-the-fact reef-and-backfill procedure.